A COLLECTION OF MAD DOCTORS AND MURDEROUS FIENDS! 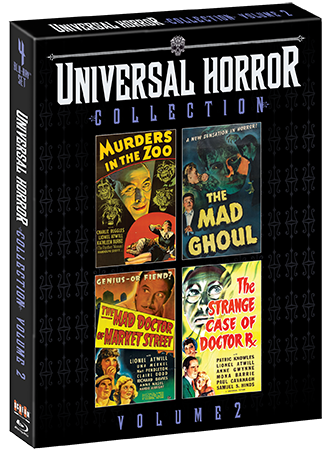 Undertake four tales of terror from the archives of Universal Pictures, the home of classic horror! 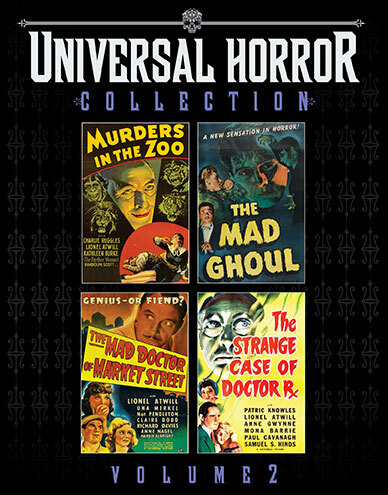 This collection includes such horror stars as Lionel Atwill, George Zucco, David Bruce and Evelyn Ankers. A maniacal hunter and collector of wild animals uses them to dispose of rivals and enemies in Murders in the Zoo. An unhinged scientist flees the San Francisco police and continues his bizarre experiments on a remote tropical island in The Mad Doctor of Market Street. A mysterious avenger is murdering acquitted criminals while dabbling in brain transplants in The Strange Case of Doctor Rx. And a doctor's experiments with nerve gas turn his assistant into a grave-robbing freak in The Mad Ghoul.